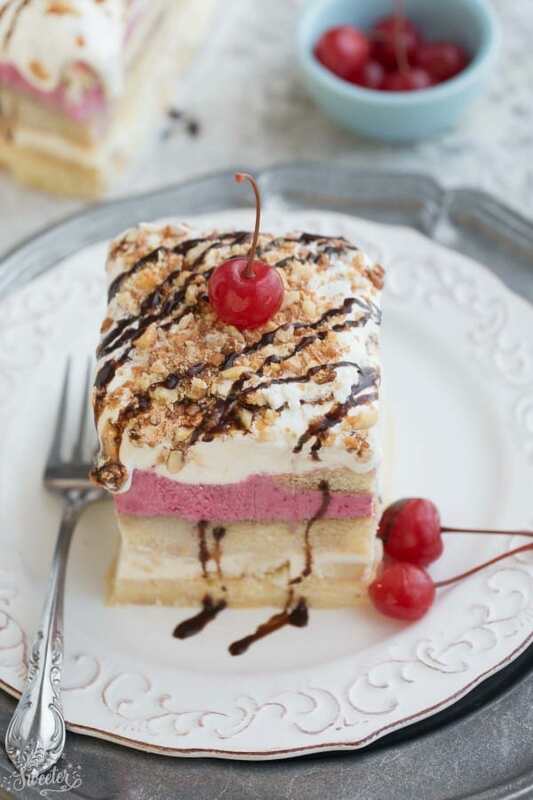 This No Bake Banana Split Tiramisu Cake is the perfect summery dessert combining two classic desserts in one. Light and airy lady fingers are layered in between pineapple, banana, strawberry and chocolate. Best of all, no oven required! It’s hard to believe that we are more than halfway through June already – my son still has two more weeks of school and we are counting down the days until summer vacation. It’s been super hot here so the kiddos and I have been keeping cool with lots of fresh fruit, homemade popsicles (coming soon) and more no bake desserts. I first shared a glimpse of this Banana Split Tiramisu Cake over on Snapchat a few weeks ago along with my Monster Cookie Icebox Cake. 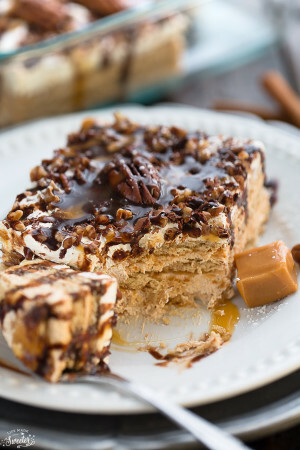 Tiramisu and banana split sundaes are two of my husband’s favorite treats and combining them into one light and refreshing no bake dessert was the perfect solution to not having to heat up the house with the oven. The best part of all is that this is fairly simple to assemble as you can see from the video. 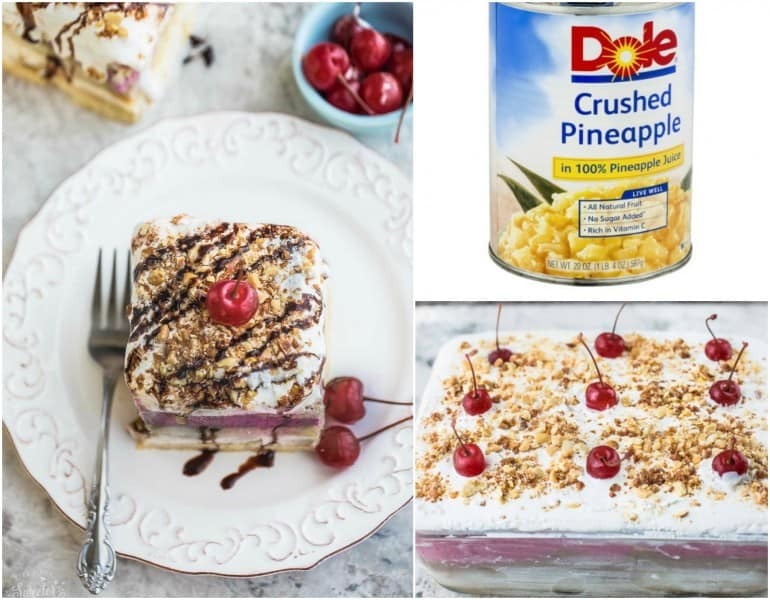 It’s made with three layers of light and airy ladyfingers and a mixture of cream cheese, whipped cream, sliced bananas, crushed pineapples, chocolate pudding and pureed strawberries. And instead of soaking them in a coffee liqueur like a traditional Tiramisu, we kept them kid-friendly and dunked them in the reserved pineapple juice from the crushed pineapples. 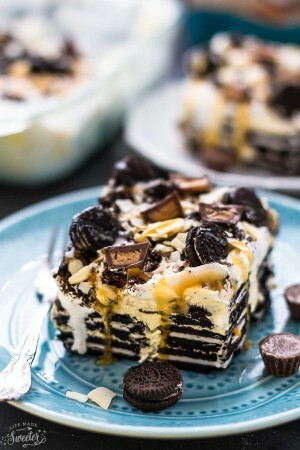 Once you assemble all the layers, spread with a layer of whipped cream and your choice of fun toppings! I used chocolate sauce, crushed walnuts, peanuts and some marachino cherries but it’s easy to customize with whatever you have on hand. 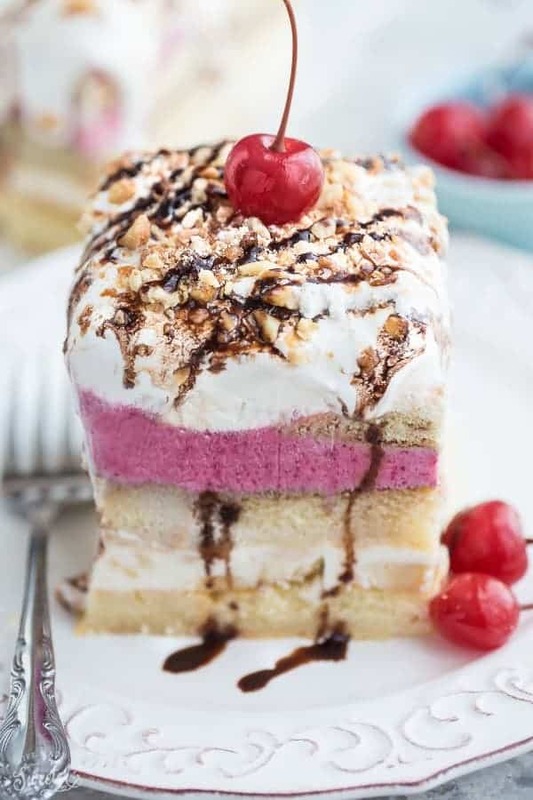 This Banana Split Tiramisu Cake makes a great dessert to bring along to a summer potluck and makes a nice treat to enjoy on a hot day. It’s delightfully creamy, cool and dreamy-licious. 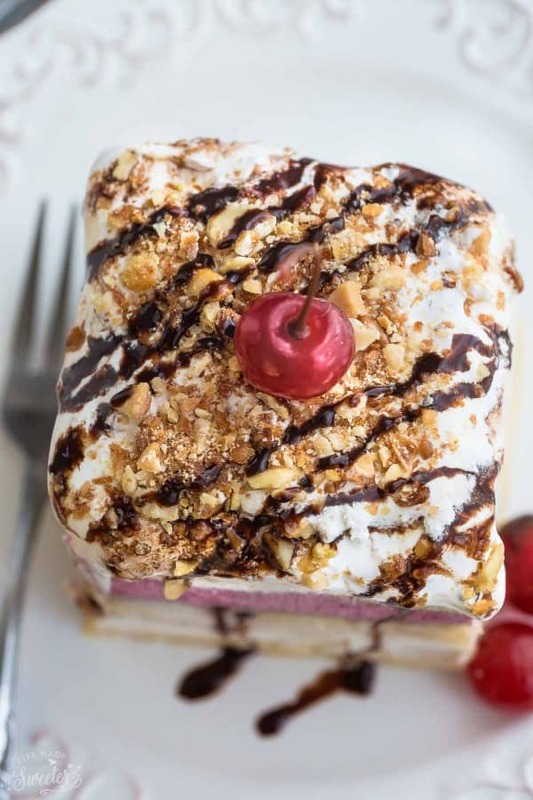 This No Bake Banana Split Tiramisu is the perfect summery dessert combining two classic desserts in one. Light and airy lady fingers are layered in between pineapple, banana, strawberry and chocolate. Best of all, no oven required! Using your stand mixer or a hand mixer, beat cream cheese until smooth. In a separate bowl, whip heavy cream until soft peaks form. Add powdered sugar and continue beating on high for another minute, until fluffy. Reserve 3/4 cup of whipped cream for topping and fold in the remaining amount into cream cheese. Combine one third (about 1 1/2 cups) of the cream cheese mixture with the crushed pineapples and set aside. Next in a separate bowl, combine one cup of the cheesecake mixture with the chocolate pudding and set aside. Dump the pureed strawberries in the remaining cheesecake mixture (about 1 cup) and set aside. Dip 12 ladyfingers in reserved pineapple juice and arrange one layer of soaked fingers in a 9 x 13 dish.Top evenly with banana slices. Spread pineapple cheesecake mixture evenly over top. Dip another 12 ladyfingers in reserved pineapple juice and arrange soaked fingers over top, pressing them down for an even layer. Top an even layer of the chocolate pudding mixture. Dip remaining 12 ladyfingers in pineapple juice and arrange over top, pressing down to make an even layer. 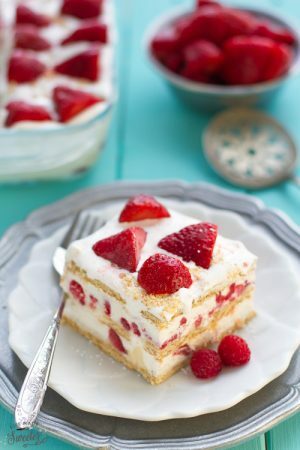 Spread with strawberry cheesecake layer. Top with reserved whipped cream and spread evenly on top. Add marachino cherries and sprinkle with chopped nuts. Cover with plastic wrap and refrigerate for at least 3 hours or overnight once layers are set. Remove tiramisu from fridge and drizzle with chocolate sauce if desired. Slice and serve with more toppings if desired.